Gray is the new white! I use this motto very often in these days to emphasize the trendy gray. Very flexible countertop color that makes the owner very happy.I think White Kitchen Gray Countertop Ideas brings you a new window in your kitchen remodeling. White Carrara Marble– White Carrara Marble Countertop consists of the tones of narrow gray veins and and seems very sophisticated. Arabescato Carrara Marble- Arabescato Carrara Marble Countertop is an exquisite combination of whites and grays with medium variation. The lines are softer than White Carrara Marble. Calacatta Classic Marble- Calcatta Classic Marble Countertop has the wide gray veining on the white surface is the indicator. The color is gray is very pale and marble itself is very romantic. Calacatta Carrara Marble- Calacatta Carrara Marble Countertop consists of very fine streams of intersecting silvered gray veins frost the alabaster white and it matches especially with off white cabinets very well. Steel Gray Granite- Shade lovers favorite, with shades of grays and small flecks of lighter grays. Impala Black Granite- African Beauty, shades of dark grays and blacks with low variation in pattern. It seems almost plain look. Very homogenous granite. New Caledonia Granite- New Caledonia granite looks incredibly trendy as it is mainly in the grayish color palette. 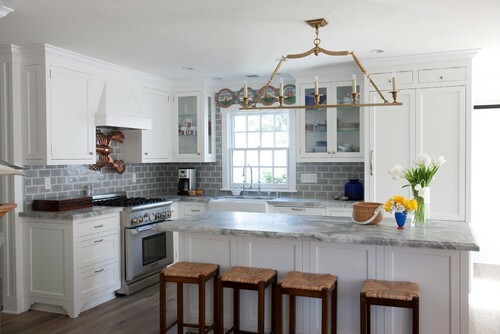 Very small gray , white and beige patterns makes the countertop eternal. Azul Platino Granite- gray and white slab granite that blends well with all interiors and design features especially in kitchens and bathrooms. Cambria Bellingham – Cambria Bellingham Countertop looks like marble by having dark gray and black swirl waves on the creamy light beige surface. Cambria Templeton- Cambria Templeton Countertop means the relaxation gray. An unassuming gray with tiny toffee-colored flecks are just designed for trendy gray. Kensho- Silestone Kensho Countertop is a light- medium gray, which has a still and shiny look without a lot of dots and flecks. Very good bet to your kitchen remodeling ideas. 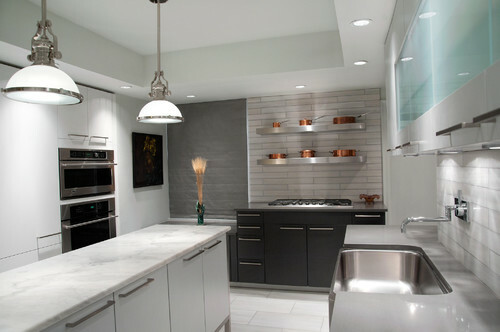 Mostly, it is used for contemporary kitchen designs and it is a good candidate for White Kitchen Gray Countertop Ideas. 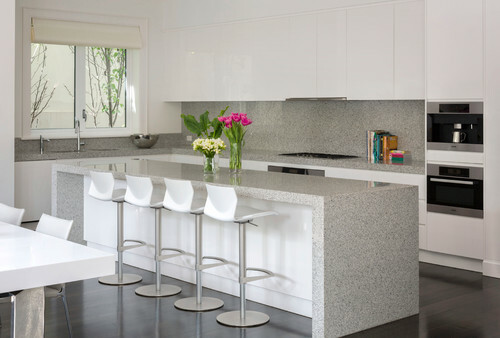 Steel- Silestone Steel Countertop has very bright shiny small white flecks on a silky gray surface. 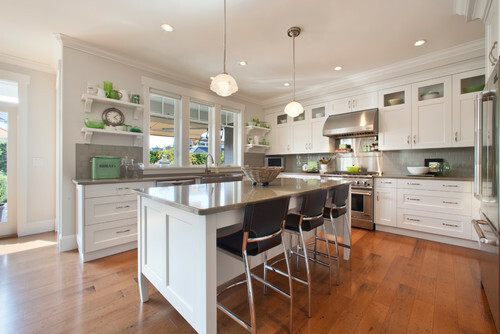 It is told as another friendly option for White Kitchen Gray Countertop Ideas. Gray Amazon- Silestone Gray Amazon Countertop and Silestone Steel Countertop are the sisters. The only difference is their flecks. Silestone Gray Amazon has shiny black flecks on a beige-gray background. Corian Ash Gray Countertop is just still and matte. The tone is medium if is compared with Corian Dark Gray Countertop and Corian Light Gray Countertop. 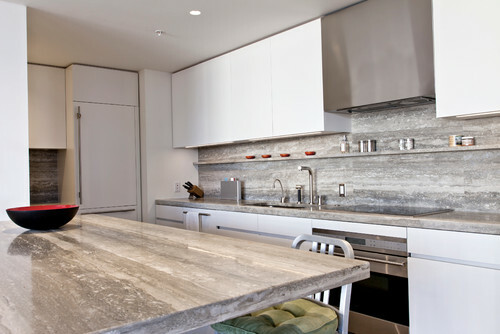 Corian Gray Countertop is a good addition for white kitchen. Below selected pictures are all great about White Kitchen Gray Countertop Ideas. Hope all would be helpful for your kitchen remodeling ideas. 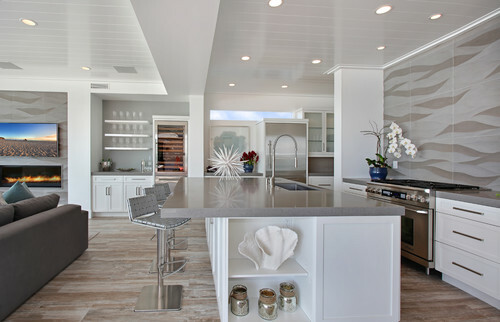 Picture credit: Andrew Frost Interiors via Houzz. and Photography; Stu Morley. 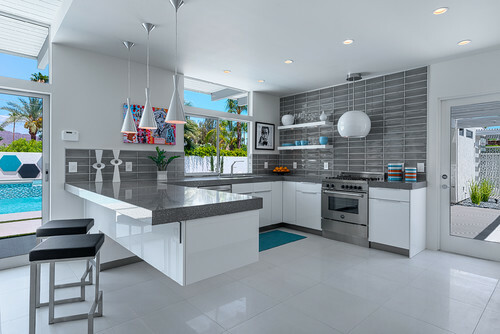 Contemporary design kitchen remodeling. Polished granite Bianco Crystal is used for backsplash and waterfall edge countertop.